Our “Turbo Case” ordering system enables you to layout your retail space more efficiently by offering standard straight cases in (3) heights, (3) depths and every 6” in lengths starting with 24” to 96”. With our many corner case and turn options; you’ll find this to be the most versatile modular showcasing system available. This is mall grade casework, finished with wood veneer (not plastic or melamine). Our veneer color options are Maple, Cherry or Mahogany. You will also have (4) metal extrusion colors, choice of halogen, fluorescent or no lighting and (5) visual layouts. 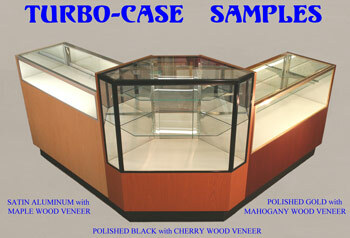 There are also many wall cases, tower cases, cash counters and displays to choose from to match the casework. If you have special needs, just give us a call, we are a “custom” design/build/install facility and we don’t mind special orders. Inside Kicks removable for easy electrical service. All cases are fully assembled, shrink wrapped and on pallets for shipping. All cases are UL Listed under wired cabinets. Contact us with your floor plan or needs. Store Fixtures can be shipped within two weeks of purchase.